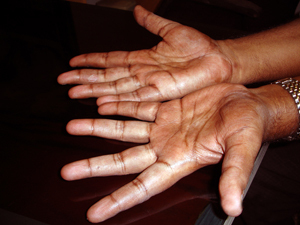 Dr. A. R. Tagore is a renowned clinician in chennai city, he practices more than 16 years. His articles had been published in many scientific journals. His study always with evidence based documents. 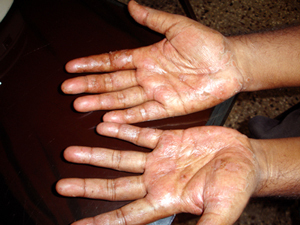 Here he present a case of Tinea Manuum. He was jaundiced four times and underwent fistulectomy in 1993. In 2006 he had a spinal surgery, disc lesions. · Habits: Addicted to cannabis indica up to 1999. · Dreams: Removal of lower part of body. · Along with placebo for one month. Patient came after a month with great relief. Within a month he completely relieved from the complaints. Now the patient wants to go to job. All of we know about the story of Sepia, how Hahnemann introduced in our Materia Medica through Dr. E. A. Farrington. It belongs to the molluscan group animal. It is a well known Antipsoric remedy and it produces vesicular, humid, raw and scaly eruptions with itching and is an antidote to Rhustox poisoning. Based on mental symptom aversion to occupation along with skin complaint, I selected sepia. Sepia also acts well in men, indeed we think mostly in women. .